Laila was leading a peaceful life in the gulf state of Bahrain with two little girls and a loving husband Mathew. Suddenly in 1994, everything in their life turned upside down when Mathew who was a chartered accountant got heart attack and died after 2 months. She returned to India with her children. In 2003 she lost her hearing completely in her left ear, unable to walk and face got paralyzed. The ENT surgeons diagnosed a large nerve tumor of the inner ear connecting to the brain. The surgeons declined the surgical options. She did not lose hope, kept her faith and prayed. Miracle did happen, her facial weakness recovered, she regained her hearing and got back to normal life. Last week, after a period of long 19 years, she came to my clinic with a complaint of losing hearing in the opposite ear. I thought the same tumor may be appearing in the opposite side, as acoustic nerve tumor can be bilateral in rare cases. I repeated the MRI Scan and to my astonishment, the tumor she had in her left ear had reduced in size considerably and got fairly normal hearing in that side. This hardly happens in cases of Acoustic neuroma. There was little hearing problem in the right ear due to infections in the sinuses, no tumor and no nerve deafness. Laila believes strongly that God heard her prayers, had touched her and healed her. 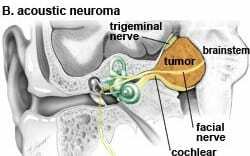 An acoustic neuroma is a benign tumor that grows in the canal connecting the brain to the inner ear. Symptoms may include difficulties with hearing and balance. Treatment is surgery and radiation therapy. An acoustic neuroma is a benign, slow-growing tumor that originates in the canal connecting the brain to the inner ear. Other name for this type of tumor include â€˜vestibular schwannoma\’. An acoustic neuroma begins in the cells that line one of the two nerves that make up the eighth cranial nerve. For unknown reasons, these cells known as â€˜Schwann cells\’ multiply out of control and form a tumor. Eventually, larger tumors may involve other structures, including the brain stem. Bilateral (on both sides) acoustic neuromas can occur in a hereditary disease called neurofibromatosis . An acoustic neuroma is usually benign, but it can still be fatal if left untreated. This is because the tumor will keep growing. Once it runs out of space inside the small canal that links the inner ear to the brain, it begins to grow into the skull cavity. Surgery â€“ microsurgery techniques are used to remove the tumor. However, side effects can include loss of hearing and facial nerve damage. Stereotactic procedure â€“ a non-invasive treatment that directs gamma radiation at the tumor. Medical science ignores the impact of faith and religion on health issues. But in recent years, scientists have begun studying the possibility that faith matters. As scientists investigate connections between the mind and the body, some scientists have found that a person’s faith can help him or her live a longer, healthier life. Prayer may strengthen the immune system in the body and it can destroy even cancer cells. People of faith are simply more optimistic and that in general they lead healthier lives. This may be due to the power of prayer, but it could also be explained by a tendency toward clean living. In addition, people active in their communities of faith may receive the help of social bonds within their religious groups. 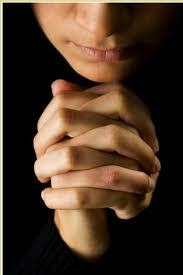 While praying for oneself may provide some health benefit, intercessory or distant prayer is another matter. Intercessory prayer (IP) is praying for a higher power to intercede on behalf of another person, usually for recovery from a health crisis. Distant prayer is a form of intercessory prayer in which someone prays for a person whom he or she has never met, often as a public request through a church or other institution of faith. Scientific study on intercessory prayer has delivered mixed results, and those on each side of the debate embrace the results that support their beliefs. On one side are those who believe that things which can\’t be proven via the scientific method doesn\’t exist. On the other side are those who believe in the power of prayer — whether science can prove it or not. Prayer can be a complementary medicine if it makes someone feel better what harm does prayer pose? If you think you have no hope, you’ve got to always think there’s hope.